It has been more than 50 years since the first labor agreement between Turkey and Germany. The stereotypical image of the labor migrant from Turkey in Germany has been of a young man. This paper, however, is about the untold stories of women workers who went and stayed in Germany as part of the labor agreement. Although there have been a significant number of women who have been affected by labor migration either as labor migrants or those who were left behind, their experiences have either remained invisible or get subsumed under those of men. 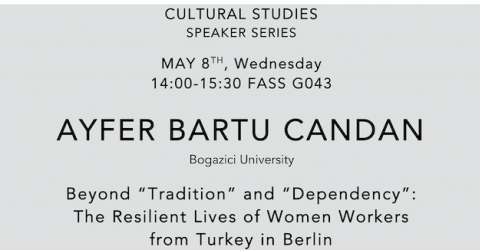 Rather than examining the experiences of these women solely through “traditions”, and “cultural norms”, I discuss these experiences in terms of their migration histories, family backgrounds, working conditions, and demographic factors. My attempt is to understand the ways in which the experiences of migrant women have been shaped by both structural factors such as the employment, housing and migration policies of the home country, and the social and cultural factors such as migration and family histories, cultural values and practices of the migrant population. I believe this study will provide an alternative to the common conceptual framework that represents these women as exclusively the victims of “tradition” and “cultural norms” and/or solely “dependents” to the male migrants.